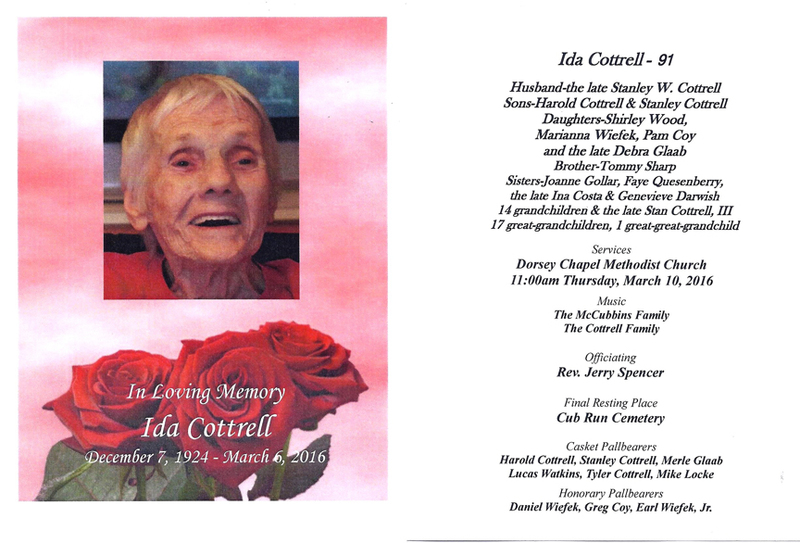 Ida Cottrell, 91 of Munfordville passed away Sunday, March 6 at her home surrounded by her family. Ms. Cottrell was born in Priceville on December 7, 1924 to the late George and Lula Willis Sharp and was the wife of the late Stanley Cottrell. She was a housewife and a member of the Dorsey Chapel Methodist Church. She was preceded in death by a daughter Debra Glaab, sisters Ina Costa & Genevieve Darwish and a grandson Stan Cottrell, III. Funeral services for Ida Cottrell will be 11am Thursday at Dorsey Chapel Methodist Church with Rev. Jerry Spencer officiating. Burial will be in the Cub Run Cemetery. Visitation will be Wednesday from 10am-8pm at the Sego Funeral Home and after 9am Thursday at the Dorsey Chapel Methodist Church until time for services. Ms. Ida has always said "don't spend your money on flowers, just a rose will do." So donations may be made to the Dorsey Chapel Church or Cub Run Cemetery Fund, these donations may be left at the funeral home.